Despite losing to the fourth placed La Liga team of last season 2-1 on Sunday, it was Arsene Wenger's Arsenal who listed the Emirates Cup title, even when both the teams finished with the same number of points at nine. Sevilla has held a 100% winning record in the pre-season tournament but what they do not hold is the Emriates Cup trophy. Despite losing to the fourth placed La Liga team of last season by 2-1 on Sunday, it was Arsene Wenger’s Arsenal who listed the Emirates Cup title, even when both the teams finished with the same number of points at nine. Despite the same number of points, the difference between the two teams – and it is a big, crucial difference in Emriates Cup – was the total number of goals scored by each team in the tournament. 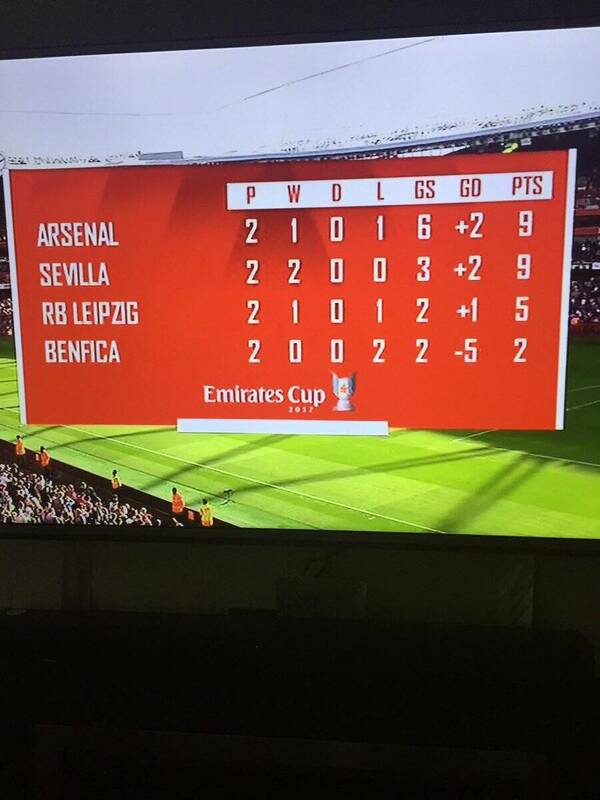 The fact that six of Arsenal’s points came from goals scored meant that they lift the title. The Gunners had, in their previous game against Benfica, found the net five times, adding one to the tally in their game against Eduardo Berizzo’s side Sevilla, who on the other hand, have three goals in total. Alexandre Lacazette scored the only goal for Arsenal, the £53m new signing, on the occasion of his first start at the Emirates Stadium. Joaquín Correa opened the scoring for the game, giving Sevilla a lead with Steven N’Zonzi doubling for the Spanish side with a brilliant strike, that went past keeper Petr Cech. Arsenal, however, had the last laugh.